"There's Fezziwig. Bless his heart. Fezziwig's alive again." Certainly some of my favourite lines in A Christmas Carol as Stephen Cantwell hits the stage for the first time in his colourful and unforgettable costume. 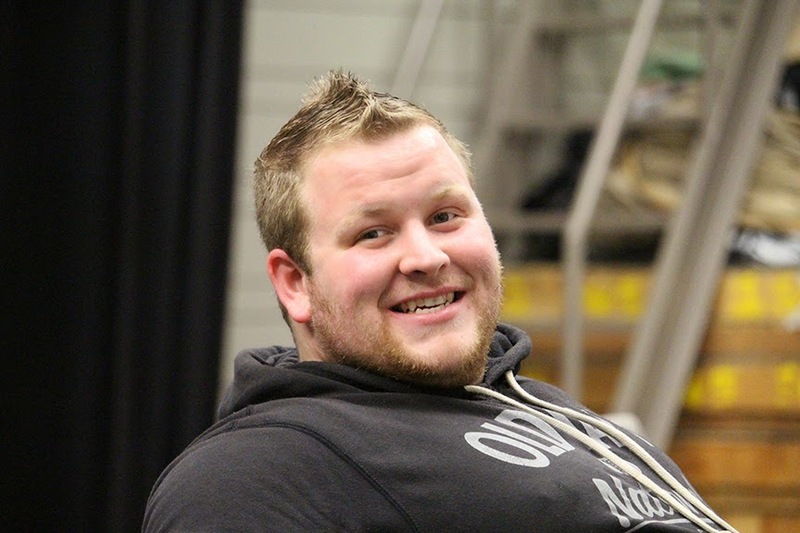 A fellow that bring a positive attitude to the stage each day, Stephen is a great addition to the company. And his singing voice - which I've had the pleasure of hearing several times in the dressing room area - is really quite something. It reminds of the late Stan Rogers in a way. As we wind down this production, I threw a few questions over to Stephen to consider which hopefully will shed some life on his and his Keyano Theatre Company experience. Who is Stephen Cantwell and how did he come to be in this show? I'm a young adult who's been in Fort McMurray on and off for 9 years. I've worked with another cast member, Janelle, for quite some time, and she actually asked me to book an audition, and here I am today. You have one of the most incredible voices I have ever heard. Do you have musical aspirations? Well thank you for the compliment I always wanted to be some sort of singer/entertainer. I was a choir boy most of my life but lost touch with it in my teenage years. If I want it to happen I've got a long road ahead of me. What has being in A Christmas Carol meant to you personally? Being in A Christmas Carol means a lot to me because it's taught me that coming out of your comfort zone is not a bad thing. It really pushes your limits and makes you think about who you really are. Do you have a favourite moment in the play? If so, which one? Oh, I absolutely have a favourite moment: as the clock is ticking while Scrooge is waiting for the ghost of Marley to appear, and he is flipping the covers and shifting from end to end of the bed in fear. Too, too funny. When you look back on this entire experience, what will stand out to you the most? There are actually two things that stand out the most for me: the people I have met and the glorious chance I've had to work with them. Everyone brings their own set of talent and it's mesmerizing to watch, from Tiny Tim's "Whoo! Hooo!" to Ole Joe and his nasty cough. The second thing is the feeling you get on stage when everyone's watching and reacting to your character. It really puts the wind in your sails. Most importantly, will you do this again, and will you be auditioning for The Odd Couple? I will absolutely be doing this again, and you will certainly see me at auditions for The Odd Couple my good Sir. I've seen how fun you are as an actor, so I can only imagine how fun it would be to have you as a director. A Christmas Carol runs tonight, tomorrow, and twice on Saturday. Auditions for The Odd Couple are set or mid-January.